Virtua fighter 1 doesn't count. I picked this up at a blockbuster for $0.99 in 99. It's the Virtua fighter 2 I got at funcoland for $2.99 when I got the Saturn in 98 I want to talk about. The best fighting game. Only Tekken II on the Sony comes close. So many moves. And impossible for a quick twitch player to dominate once you get the counter moves. 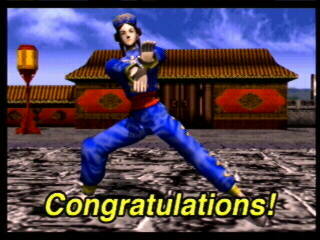 Having a 16 year old son that was real good at picking up the best moves in any fighting game was frustrating. But VF II had counters and blocks for every situation. I picked one character. Pai. And played and played and downloaded her complete move list. 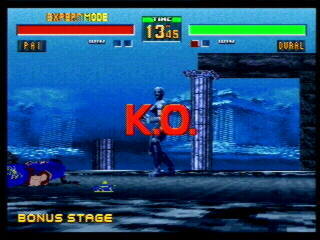 And mastered it till I finally faced Dural in the final match. And I was able to beat my kid more than half the time. Although I have to admit several sleepless nights while trying to beat the game because of tweaked nerves. Such a strange underwater battle. The silver female robot is called Dural. I keep forgetting how to get the special movie at the end of the game. And since it wastes an unbelievable 180 blocks of memory I always wipe it out. The characters in this series have evolved a little. There are some import disks with character bios and art and extras. There is the fighters remix, which is nothing more than an expanded vf1. 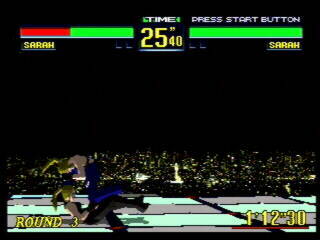 And the fighters megamix which combines vf II with fighting vipers. And my favorite. Virtua Fighter Kids. This is Virtua Fighter II with modified character graphics with big heads and kid like background graphics. And new FMV storylines. My younger kids like watching the pow pow pows and the cute graphics.